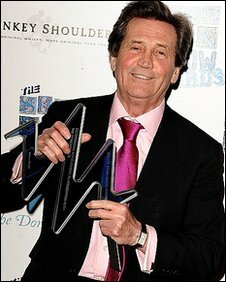 Melvyn Bragg has been presented with a special award at the last ever South Bank Show Awards. Lord Bragg, 70, received the Outstanding Achievement award as his flagship ITV arts programme entered its final months, after 30 years on air. He told the BBC it had been a "very emotional" day. Artist Anish Kapoor, pop act Florence and the Machine, author Adam Foulds, and film director Andrea Arnold were among the winners at the London event. The guest list included Rolling Stone Ronnie Wood, theatre impresario Andrew Lloyd Webber, comedian Michael McIntyre and artist Tracey Emin. In other awards, Britain's Got Talent winners Diversity lost out to the Royal Birmingham Ballet in the Dance category, while BBC Two political comedy The Thick Of It scooped the Comedy prize. Channel 4's Red Riding won the TV Drama gong, and the production of Peter Grimes at the ENO won best Opera. Hollywood star Rachel Weisz collected the theatre prize on behalf of the Donmar Warehouse for its production of A Streetcar Named Desire, which she starred in. The Arts Council England's Diversity Award, presented by Radio 1 DJ Jo Whiley, went to playwright and performing artist Julie McNamara, while The Times Breakthrough Award went to artist David Blandy. The award nominees reflected the diverse nature of the South Bank Show, which will be screened for the last time later this year. Lord Bragg was presented with his award by Sir David Attenborough, along with taped testimonials from Prince Charles, Clive James, Beryl Bainbridge, PD James and Victoria Wood. Speaking afterwards, Lord Bragg said: "I managed to fight back the tears... but it was a close run thing at the very end after David Attenborough said the things he said. "It was a great afternoon, and I hadn't expected that kind of warmth and that kind of praise. I come from a background where you don't get praise, but it was amazing, it really was." Lord Bragg said he was "baffled" by ITV's decision to axe the show, while Prince Charles said it was "a sad loss". He added it was "the very end of one of the most important beacons of the arts this country has been lucky enough to enjoy". "The South Bank Show has been much admired, along with Melvyn Bragg's steadfast determination to force so many serious artists and their work into the midst of the popular agenda," Prince Charles said. "Civilisation needs all the help it can get, more so today than ever before, but now it loses one of its greatest champions." The final South Bank Show Awards were held at the Dorchester in central London and will be broadcast on ITV1 at 2215 GMT on Sunday.